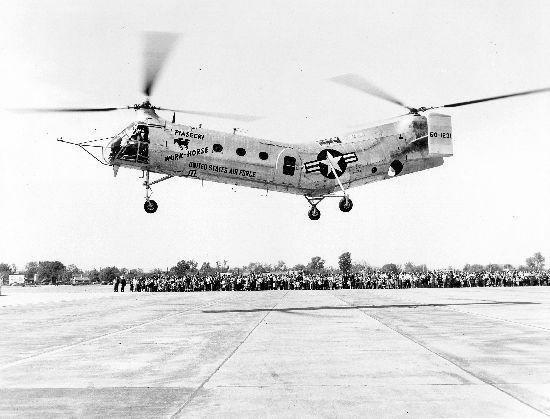 11 April 1952: At the Piasecki Helicopter Corporation factory at Morton Grove, Pennsylvania, the first YH-21 tandem-rotor helicopter, serial number 50-1231, made it’s first flight. The test pilots were Leonard Joseph (“Len”) LaVassar and Martin P. (“Marty”) Johnson, both former U.S. Navy aviators. The Piasecki Helicopter Corporation built 18 pre-production YH-21-PH helicopters, followed by three production variants, the H-21A, H-21B and H-21C. The U.S. Air Force immediately ordered 32 H-21A helicopters for Search and Rescue operations. The Workhorse was well suited to cold weather operations and it was widely used in Alaska, Canada, and the Antarctic. Another 163 H-21B models were ordered as a troop transports. The U.S. Army ordered a similar H-21C variant. 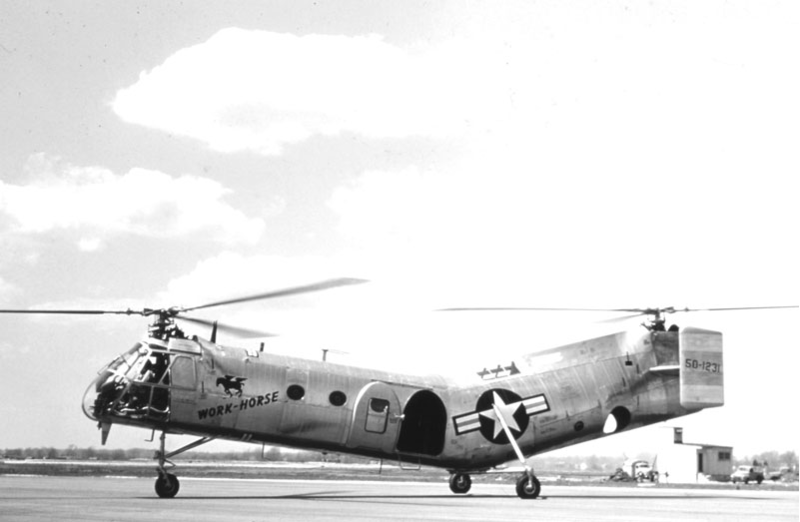 Piasecki YH-21 Work Horse 50-1231, with rotors turning. The YH-21 was a single-engine, tandem-rotor transport helicopter. It was normally operated by two pilots, with a flight mechanic (crew chief), and could carry up to 20 soldiers under ideal conditions. 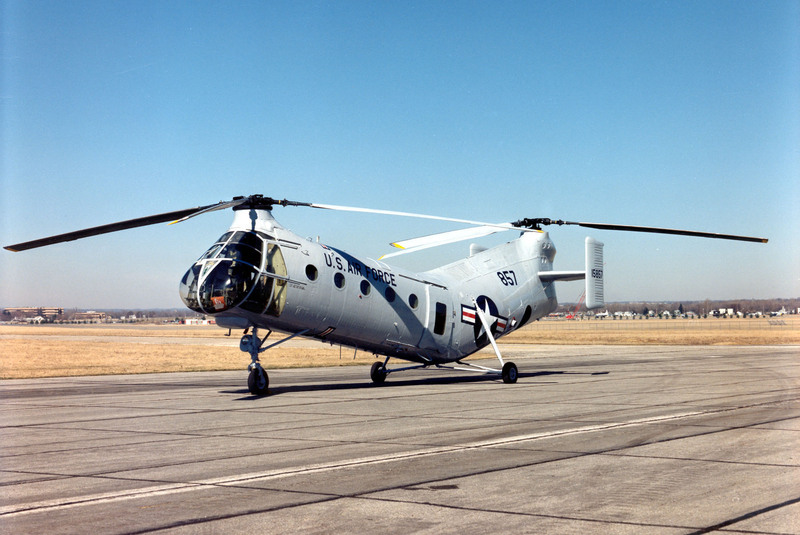 With rotors turning, the YH-21’s overall length was 86 feet, 5 inches (26.340 meters). The fuselage was 52 feet, 6 inches (16.002 meters) long, and the helicopter had an overall height of 16 feet, 0 inches (4.877 meters). The rotors were 44 feet, 0 inches (13.411 meters) in diameter. 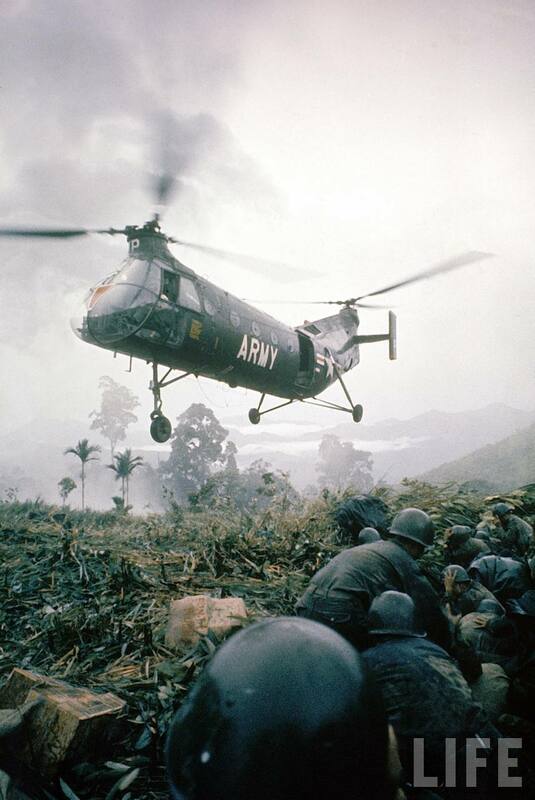 The YH-21’s empty weight was approximately 8,117 pounds (3,682 kilograms) and maximum gross weight was 14,500 pounds (6,577 kilograms). The H-21 was powered by a single air-cooled, supercharged, 1,823.129-cubic-inch-displacement (29.875 liter) Wright Aeronautical Division Cyclone 9 863C9WD1 (R-1820-103) nine-cylinder radial, mounted inside the fuselage at midship, and drove the front and rear rotors in opposite directions through drive shafts and gear boxes. The Wright R-1820-103 engine was rated at 1,275 horsepower at 2,500 r.p.m., and 1,425 horsepower at 2,700 r.p.m., for takeoff. This direct-drive engine had a compression ratio of 6.80:1 and required 100/130 aviation gasoline. The engine was 4 feet, 0.50 inches (1.232 meters) long, 4 feet, 6.95 inches (1.396 meters) in diameter, and weighed 1,350 pounds (612 kilograms). Wright built 971 R-1820-103s from November 1950 through 1957. The YH-21 could reach a maximum speed in level flight of 131 knots (151 miles per hour/243 kilometers per hour). Its Never Exceed limit (VNE) was 151 knots (174 miles per hour /280 kilometers per hour) (diving). The maximum Sea Level range was 397 nautical miles (457 statute miles/735 kilometers) at 125 knots (144 miles per hour/232 kilometers per hour). Its service ceiling was 19,200 feet (5,852 meters). 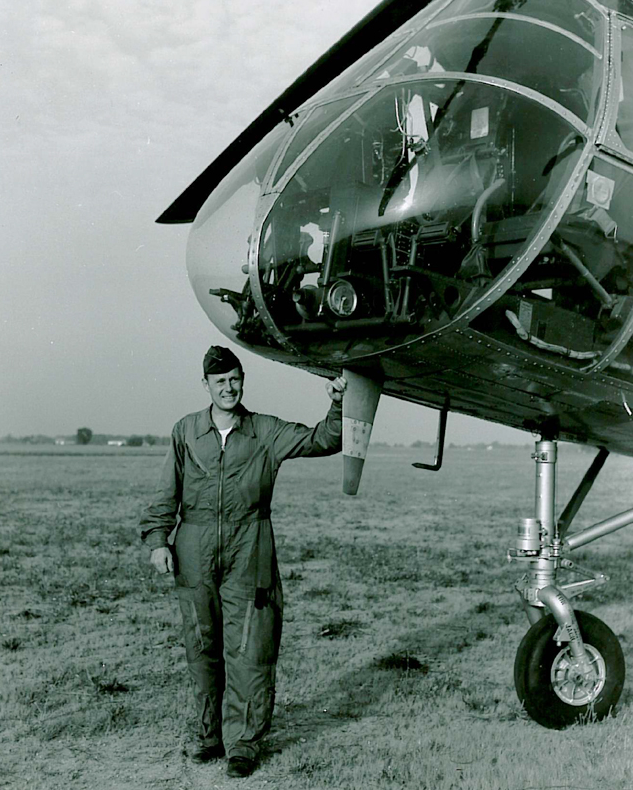 In 1955, Piasecki became Vertol and eventually Boeing Vertol. The company would continue to produce tandem rotor helicopters such as the H-46 Sea Knight and the CH-47 Chinook, which is still in production. 2 September 1953: At the Dayton Air Show, Captain Russell Martin Dobyns, United States Air Force, flew a Piasecki YH-21-PH Work-Horse tandem rotor helicopter to an altitude of 6,739 meters (22,110 feet), setting an Fédération Aéronautique Internationale (FAI) World Record for Altitude Without Payload for reciprocating-engine helicopters.¹ This record still stands. 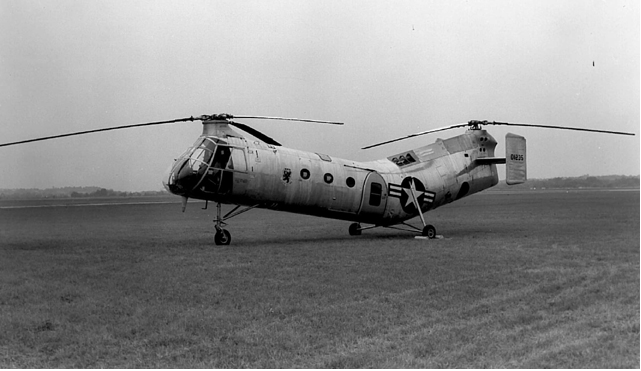 The Piasecki YH-21 Work-Horse made its first flight at Morton Grove, Pennsylvania, just over four months earlier, on 11 April 1952. It was a single-engine, tandem rotor transport helicopter. The Piasecki Helicopter Corporation built 18 pre-production YH-21-PH helicopters, followed by three production variants, the H-21A, H-21B and H-21C. Major Dobyns’ record-setting YH-21 was the fourth pre-production aircraft. 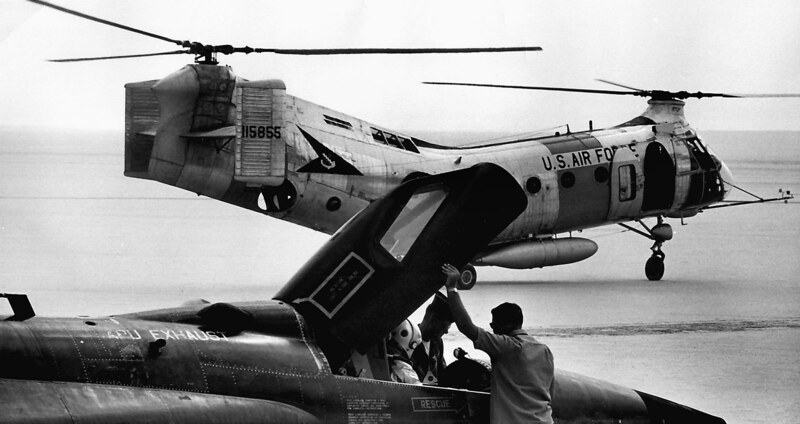 In 1962, the helicopter was redesignated CH-21. In U.S. Army service, the H-21 was named Shawnee, in accordance with the Army’s tradition of naming its aircraft after Native American tribes. The H-21A could be flown by a single pilot, although it was normally operated by two pilots, with a flight mechanic (crew chief), and could carry a maximum of 16 persons, including crew members. With rotors turning, the ship’s overall length was 86 feet, 5 inches (26.340 meters) (86 feet, 4 inches for the H-21B). The helicopter was 52 feet, 2 inches (15.900 meters) long with its blades folded, and it was 16 feet, 0 inches (4.877 meters) high. Each three-bladed rotor had a diameter of 44 feet, 0 inches (13.411 meters). The angle in the fuselage was intended to provide adequate vertical clearance between the intermeshing fore and aft rotor assemblies. (Later tandem rotor helicopters use raised pylons.) The rotor blades were constructed of wood around a steel spar and covered with 3-ply mahogany plywood. The airfoil is symmetrical. Each blade is 19 feet, 6.50 inches (5.956 meters) long and 1 foot, 6.00 inches (0.457 meters) wide. There is 5° 37′ of negative twist from the blade root to tip. The individual rotor blades weigh 178 pounds (80.74 kilograms). The forward rotor turned counter-clockwise, as seen from above. (The advancing blade is on the helicopter’s right side.) The rear rotor turns the opposite direction. Normal operating speed for the main rotors was 235 to 260 r.p.m. (233–350 r.p.m. in autorotation, with a transient droop to 210 r.p.m.). At 250 r.p.m., the blades’ tip speed is 594 feet per second (181 meters per second). The counter-rotating rotors cancelled out engine torque, eliminating any need for a tail rotor. The H-21A had an empty weight was 7,966 pounds (3,613 kilograms), with a gross weight of 11,500 pounds (5,216 kilograms) and maximum overload weight of 13,500 pounds (6,123 kilograms). It could carry a maximum external load of 3,000 pounds (1,361 kilograms). The H-21 was powered by a single air-cooled, supercharged, 1,823.13-cubic-inch-displacement (29.876 liter) Wright Aeronautical Division Cyclone 863C9WD1 (R-1820-103) nine-cylinder radial, mounted inside the fuselage at midship, and drove the front and rear rotors in opposite directions through drive shafts and gear boxes. The Wright R-1820-103 engine was rated at 1,275 horsepower at 2,500 r.p.m., and 1,425 horsepower at 2,700 r.p.m., for takeoff. (Installed in the H-21A, the engine was restricted to a 30-minute limit above 2,500 r.p.m.) This direct-drive engine had a compression ratio of 6.80:1 and required 100/130 aviation gasoline. The engine was 4 feet, 0.50 inches (1.232 meters) long, 4 feet, 6.95 inches (1.396 meters) in diameter, and weighed 1,350 pounds (612 kilograms). Wright built 971 R-1820-103s from November 1950 through 1957. 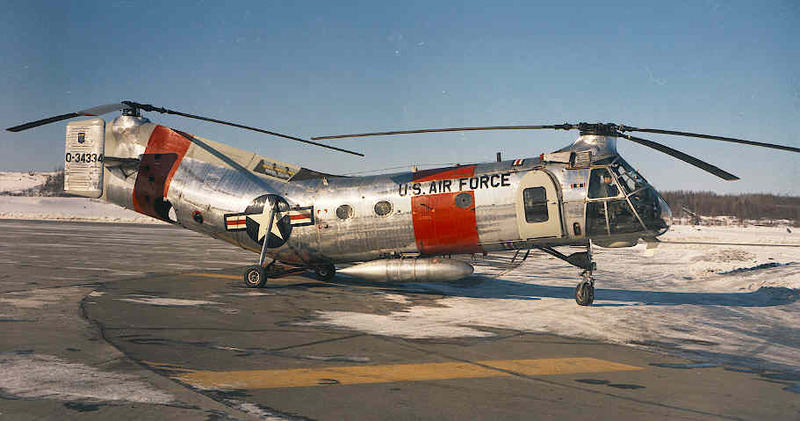 The H-21A had a maximum speed of 100 knots (115 miles per hour/185 kilometers per hour) and could hover sideways at up to 40 knots (46 miles per hour/74 kilometers per hour). The helicopter could land and take off from sloped surfaces up to 20°. Under standard atmospheric conditions, at a gross weight of 11,500 pounds, the H-21A could hover in ground effect (HIGE) at approximately 9,500 feet (2,896 meters), and out of ground effect (HOGE) at about 6,750 feet (2,057 meters). The H-21A had an internal fuel capacity of 300 U.S. gallons (1,136 liters), giving a maximum range under cruise conditions of 481 nautical miles (554 statute miles/891 kilometers) at 10,000 feet (3,048 meters). Its service ceiling was 19,200 feet (5,852 meters). The U.S. Air Force immediately ordered 32 H-21A helicopters for Search and Rescue operations. The Workhorse was well suited to cold weather operations and it was widely used in Alaska, Canada, and the Antarctic. Another 163 H-21B models were ordered as a troop transport. The U.S. Army ordered a similar H-21C variant. Russell Martin Dobyns was born in Norton, Virginia, 2 July 1921. He was the son of Bridie Witten Dobyns, a grocery salesman, and Zollie Russell Martin Dobyns. He attended Norton High School in Norton, Virginia, graduating in 1940. He then entered the University of Tennessee at Knoxville, as a member of the Class of 1944. Dobyns was a member of the Pi Kappa Alpha (ΠΚΑ). Russell Dobyns enlisted as an aviation cadet in the Air Corps, United States Army, on 16 June 1942. He had brown hair, blue eyes, was 5 feet, 6 inches (1.68 meters) tall, and weighed 150 pounds (68 kilograms). Trained as a pilot, he was discharged 29 August 1943, and then commissioned as a second lieutenant, 30 August 1943. During World War II, Lieutenant Dobyns flew 32 combat missions over Europe as a pilot of a B-17 Flying Fortress heavy bomber. Returning to the United States, Dobyns married his wife, Ada, in 1945. They would have a son, Russell Martin Dobyns, Jr., born 25 November 1946. Following the war, Dobyns remained in the military until being released from active duty 30 March 1950. Less than three months later, he was recalled to active duty because of teh Korean War. Major Dobyns retired from the Air Force 5 February 1964. Entering civilian life, Dobyns was employed as an aeronautical engineer by the Lockheed Aircraft Corporation at Marietta, Georgia. Major Dobyns’ son, Russell, a Lance Corporal, United States Marine Corps, was killed in action in teh Quang Tri Provinve of Veietnam, 10 May 1969. Russell Martin Dobyns, Sr., died in Fulton County, Georgia, 17 August 2007. His remains were interred at the Arlington Memorial Park, Sandy Springs, Georgia.